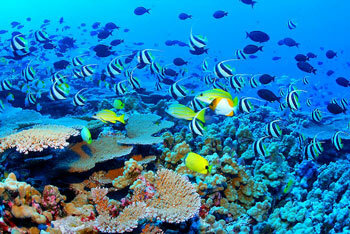 example of a complex marine ecosystem. An ecosystem is a collection of plant, animal and micro-organisms living in the same habitat, together with their physical surroundings, and it is a completely independent unit of interdependent organisms. A number of food webs usually form within each ecosystem which shows the interdependence of the organisms. Examples of ecosystems include; desert, rainforest, savanna, tundra, taiga, urban ecosystem, and marine ecosystem.